Whenever you see images of Amsterdam it is mostly of the historic city centre. Yes those pretty canals with their beautiful 17th century houses are what defines Amsterdam, but passed the ring of canals there is a large and much lesser known part of this vibrant city. When it comes to cycling infrastructure that rest of Amsterdam really has a lot more to offer than the traffic calmed city centre. 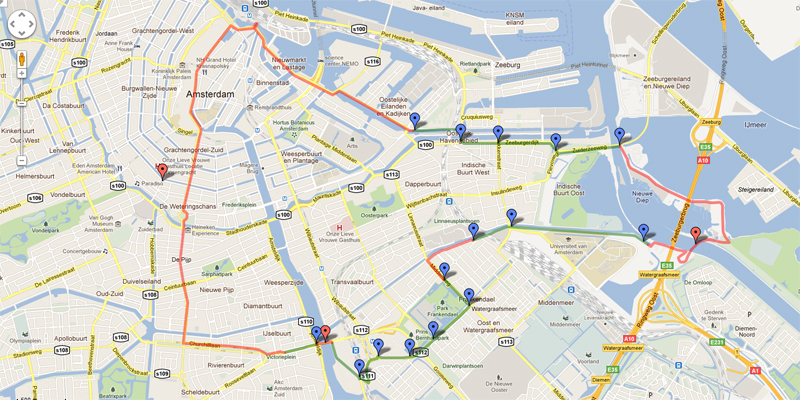 On September 30th last, I rode a bicycle through Amsterdam for the very first time in my life. It had just never come to it. 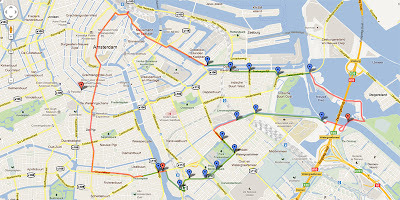 With the help of OV-fiets and because I wanted to film both Nescio Bridge and Berlage Bridge (you saw those video’s earlier), I finally rode through the city in which my father’s father was born. is also common in Amsterdam. More info in an earlier blog post. To be honest, riding in Amsterdam wasn’t very special. Cycling infrastructure in the Netherlands is very similar wherever you ride. After over 30 years of experience a standard has grown which is widely used throughout the country. Just as there is a standard way of building motorways with similar exits etc. that is widely accepted as the safest way to build motorways, the Netherlands has developed a way to build cycling infrastructure, that is widely acknowledged to be the safest way to build it. 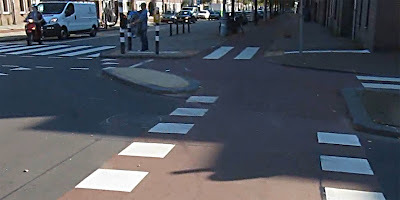 This leads to very similar junctions and paths which is also in line with one of the pillars of Dutch infrastructure design: road design should be instantly recognized by road users to increase safety. My ride in Amsterdam and the parts in green that can be seen in the video. In order for you to follow where I rode, there is also a Google map with links to the corresponding time frames in the video. This was asked for the recent Maastricht video, so I thought it would be good to have for this video too. Good video. This confirms the impression I have received of Dutch cities that I have cycled in. If you just see the centre, as foreigners will often do, you get a false impression that the cycling is all about the traffic-calmed streets and shared spaces and that the safety just arises from the large number of cyclists. You have to look at the suburbs to see the importance of the main-road and off-road cycle tracks in generating all that that cycle traffic and taking it to the centre of the city. I didn't realise the Dutch used push-button crossings for bikes, but there is one at 2 minutes in. @David yes we do have push-buttons. But as you can see at 1:15 they are usually combined with detection loops ahead of the junction. Which means that you only really have to use them in case the loop didn't detect you. Often (as at 1:15) the light turns green before you can even get to the button right at the moment you reach the light. @442974 David didn't leave out anything, that was me, Mark. Your StreetView picture of Ferdinand Bolstraat is very outdated! Amsterdam is building a metroline under that street. THIS is what it looked like a year ago. I think it didn't change much since last year. I don't know, because I haven't been there for a long time. Building will go on for quite a few years. After that, the street will no doubt be updated. Judging from the fact that cyclists can still use the street during the building activities, you can trust the street will never again look like your outdated streetview picture, but will have modern facilities for cycling. Google StreetView is no good tool to find out what Dutch streets look like now. As David has pointed out before: in the 4 years he has lived in the Netherlands he has seen a major change already. Most StreetView pictures are a lot older than 4 years. But they can be used to show a before and after image. Great facilities. Except, why are motorbikes or scooters allowed on the cycle paths? That doesn't seem safe at all. @James D. yes we all agree on that one: scooters áre dangerous on the cycle path. Not if they would stick to the maximum speed (25kph) because that is almost the same as a cyclist, but they never do. This is under debate. Thanks for your reply, Mark. I'm still surprised that scooters are allowed on the path at all. There is no way to enforce a 25k speed limit, and owners of scooters seem unlikely to limit their own speed if they can get away with going faster. I can see road rage incidents developing at junctions when cyclists catch up with scooters that have just zoomed past them. Here in Australia we don't have the level of cycling paths that you do there, but if a scooter zoomed past me like that, I'd be tempted to push them into a tree! I just realised why I knew the name of Ferdinand Bolstraat. There was an article about it earlier on this blog, talking about how the shopkeepers along the road want cyclists more than trams. As for mopeds. I think it's fair to say, as Mark did, that "we all agree" that we don't like mopeds. However, I feel I have to point out that the problems they cause are probably less than you think. In some places they seem to be genuinely a nuisance. In many others they're rarely seen. Also the point about limiting their speed. As I understood it, that is supposed to be the top speed of the type of mopeds allowed on the paths i.e. same as an assisted cycle. So if I have that right, then it's not a question of the rider opening the throttle too much, but of de-restricting the moped or using a more powerful type of scooter. And yes they were unsettling, but more of a huge annoyance.